WooCommerce Product Image Watermark is a WooCommerce Plugin which allows you to add Text/Image Watermark for Product Images, Product Full Images, Catalog Images, Product Thumbnails etc. You can also apply watermark by Include/Exclude by Products/Categories. Supports Simple and Variable Products. You can set Multiple Rules to choose the Images for Watermark. How to Install WooCommerce Product Image Watermark? 1. Download the latest version file (woocommercewatermark.zip) of WooCommerce Product Image Watermark from Codecanyon. 2. Unzip woocommercewatermark.zip inside which you will find the Plugins files i.e. woocommercewatermark.zip. 3. 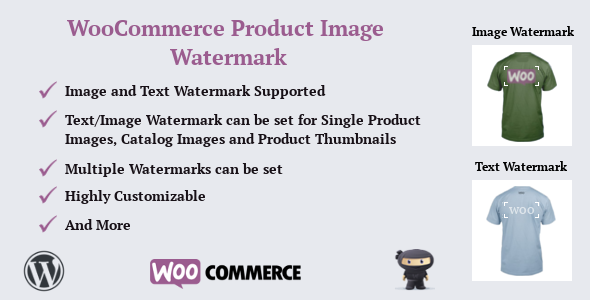 Install the latest version of WooCommerce Product Image Watermark i.e. woocommercewatermark.zip using WordPress Dashboard. How to Upgrade to a newer version of WooCommerce Product Image Watermark? If you are using an older version and want to upgrade to the latest version of WooCommerce Product Image Watermark then please do the following steps. 1. Deactivate and Delete the existing version of WooCommerce Product Image Watermark in your site. 2. Download the latest version file (woocommercewatermark.zip) of WooCommerce Product Image Watermark from Codecanyon. 3. Unzip woocommercewatermark.zip inside which you will find the Plugins files i.e. woocommercewatermark.zip. 4. Install the latest version of WooCommerce Product Image Watermark i.e. woocommercewatermark.zip using WordPress Dashboard.